Forerunner, Metropolitan Hilarion of Eastern America & New York led the Lesser Consecration and celebration of Divine Liturgy in the Stavropegial Metropolitan Metochion Church of the Icon of the Mother of God "The Inexhaustible Chalice" in Brighton Beach, NY. Concelebrating with the First Hierarch of the Russian Church Abroad were Eastern American Diocesan vicar Bishop Nicholas of Manhattan, church dean Archimandrite Elevferiy (Skiba), parish clerics Hieromonk Laurus (Solomonov) and Protodeacon Dionysius Lvov, and Priest Michael Vladimirov (rector of St. Mark the Evangelist Mission in Rockaway Beach, NY). 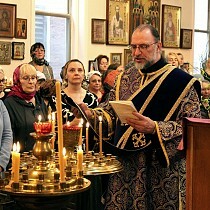 Praying in the altar was parish rector Archpriest Alexandre Antchoutine. After the reading of the Hours, Metropolitan Hilarion led the Lesser Consecration of the Church, sanctifying the newly constructed altar table, church furnishings, and icons. Divine Liturgy celebrated served under the aegis of the Protectress of Russian Diaspora – the Kursk Root Icon of the Mother of God. At the Little Entrance, in accordance with the resolution of the Synod of Bishops, Metropolitan Hilarion elevated Fr. Michael Vladimirov to the rank of archpriest. After Liturgy, Metropolitan Hilarion addressed the many believers with a sermon. He then congratulated the clergy and parishioners with the momentous occasion. 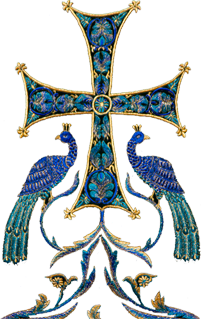 Metropolitan Hilarion also read aloud a directive accepting Hieromonk Laurus (Solomonov) into the Eastern American Diocese and officially appointing him a cleric of the metochion church. The First Hierarch likewise greeted Fr. Michael Vladimirov, congratulating him on his elevation, as well as the opening of the mission parish of St. Mark the Evangelist in Rockaway Beach, of which Fr. Michael is rector. With the Metropolitan’s blessing, Fr. Alexandre presented Fr. Michael with a specially written icon of the Holy Evangelist Mark, as well as the former altar table and a number of liturgical items for the mission. A bountiful luncheon was prepared for all by the parish sisterhood, where interaction continued throughout the day.